The Amazing Spider-Man #28 sounds on the surface like it would be a great book. It features classic bad guy Norman Osborn going face-to-face with Peter Parker in a “no holds barred” brawl. Neither man has his powers to rely on, which means it’s just a gold old fashioned slugfest — the winner will likely be the guy with a deeper reserve of intestinal fortitude. Sadly, writer Dan Slott once again over-promised and under-delivered. 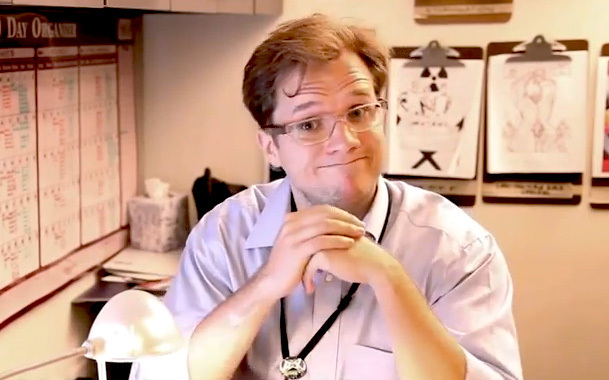 If you ever wondered what Marvel’s editors like Nick Lowe do these days, ASM #28 provides the answer: not much. This is the kind of comic you get when you use nostalgia as a crutch to hide a lack of character development. This is the kind of comic you get when you want to be buddies with your writer instead of his editor. This is the kind of comic you get when you, as the writer, create a digital echo chamber and block anyone who offers intelligent criticism of your work. This is the kind of comic you get when you think that giving a tacit nod to your critics somehow erases the legitimacy of their claims. Aspiring writers should read ASM #28, if for no other reason than to see what happens when a decent idea crashes head-first into a wall of hubris. Listen to your critics. Learn from them. Humble yourself before the collective wisdom of your fans and then adjust to what you’re hearing because if you don’t then you will write stories that fall flat. For more on this topic, I invite you to check out my latest YouTube review. As always, make sure to subscribe if it’s up your alley and leave any feedback you have in the comments section below. Whether it’s on YouTube or this blog, I read them all and try to respond to as many as possible. 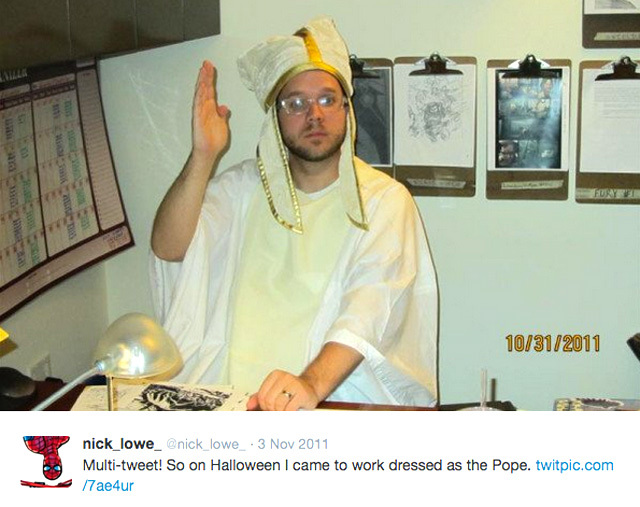 Marvel Senior Editor Nick Lowe is the type of guy who dresses up as the pope on Halloween because he’s scared to death of what would happen if he pranced around the office as an imam or Mohammed. Marvel Senior Editor Nick Lowe is the type of guy who dresses as the pope for Halloween because Dan Slott would probably not find it funny to see his editor mock Orthodox Jew rabbis on Halloween. Marvel Senior Editor Nick Lowe is also the kind of guy who needlessly burns bridges with loyal Marvel customers in the Letters to the Editor section of The Amazing Spider-Man. It’s no secret that Marvel has run its Letters to the Editor section like something out of the Kim Jong-un School of Journalism for quite some time. Issue #17 of The Amazing Spider-Man continues that trend, although 1 out of 9 letters actually provides a critique of Dan Slott’s work. How often do we get one-issue stories? Two-parters? Character studies? Slice of life? Of yeah, Slott is a self-confessed plotter by nature. Howard Mackie’s run is downright readable in comparison to most of Slott’s work. History won’t remember the BND/Big Time/Superior/Relaunch era fondly at all. Mr. Knight is not too happy with the current direction of the book. However, it’s obvious that he’s been reading Spider-Man for years. He’s a loyal Marvel customer. He has stuck through the book through thick and thin. Say what you want about the tone of his email, but he’s clearly sunk loads of cash into Marvel, and by extension Nick Lowe’s and Dan Slott’s bank accounts. One would think that Mr. Lowe would be grateful for such customer loyalty and, even in the face of hard-nosed criticism, respond in a professional manner. Mr. I-dress-up-as-the-pope-because-I’m-scared-to-dress-up-as-Mohammed Lowe chose the “We don’t need you” route instead. Hi, Ryan. Sorry you don’t like Dan’s run, but you certainly seem to know it very well. If you’re a Gerry Conway fan, definitely pick up Amazing Spider-Man #16.1, on sale now. It’s the first part of a five-parter (sorry). Pains me that you’re so unhappy, so take this as permission to leave the book behind. I’m a big fan of Dan’s work and won’t be replacing him any time soon, providing we’re still publishing Spider-Man after Secret Wars. In the mind of Nick Lowe, Marvel’s faux pope, it is a mortal sin to question the direction of The Amazing Spider-Man, even if you’re someone who has been religiously buying the book for decades. Question Dan “deus ex machina” Slott’s work, and you must be excommunicated from the Church of Marvel. If you’re like me, then you long ago realized that Marvel decided on a business model that involves needlessly lashing out at paying customers. If you’re like me, then perhaps you’ve become much more discerning in which books you buy each month — if any — from the company. The next time you see Nick Lowe at a Comic Con, ask him when he’s going to be Mohammed for Halloween, and then let him know what you think about Marvel’s “permission to leave” business model. Hi, My name is Nick Lowe. I think it’s a good idea to tell loyal Marvel customers to take a hike when they disagree with the direction of a book. I also dress up as the pope on Halloween because I know Catholics turn the other cheek. Dressing up as an imam or Mohammed as a joke would actually require me to display courage, so I won’t do that.